Although Huffington Post, BuzzFeed and Ezra Klein’s new Vox.com generate considerable attention as representatives of the digital media future, they are in fact, not typical representatives of the native digital news landscape. 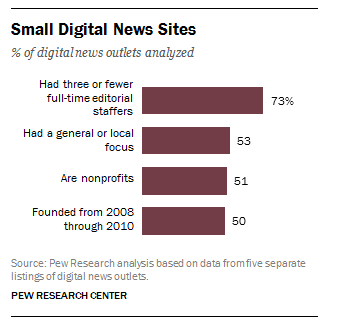 A new Pew Research Center State of the News Media analysis finds that the growing digital news world is largely comprised of hundreds of smaller sites, often local in scope, that are working to fill gaps left by legacy reporting cuts. While there is variation within this universe of digital native news outlets, our analysis of 438 of them has found that many fit a different composite: The typical outlet is between four and six years old; editorially, it is focused on coverage of local or even neighborhood-level news; it is just as likely to operate as a nonprofit organization as for-profit model; and it has a lean full-time editorial staff of three or fewer people. Youth Shall Be Served. Exactly half of the 414 outlets for which we had a founding date came into existence from 2008 through 2010. Those are the years when about 11,000 newspaper newsroom jobs were lost as the economic recession took its toll. While the pace of small digital startups has slowed notably in recent years, 16% (65) of them were created between 2011 and the first few months of 2014. At the same time, several dozen of the outlets in the Pew Research accounting (28, or 7%) predate the year 2000. One such digital news graybeard is the 17-year-old Cape Cod Today. A Lean Workforce. Small budgets tend to mean small staffs and that is the case for a large majority of the digital native news outlets. All totaled, nearly three-quarters (241) of the 329 sites for which we could determine staffing levels had three or fewer full-time editorial staffers. Indeed, the most common staffing level was three employees, which was the case at 128 (or 39%) of these sites. Another 63 outlets, or 19%, employed somewhere between five and 10 full-time staffers. The size of these organizations hews closely to the results of a Pew Research survey of nonprofit outlets in which slightly more than three-quarters of them reported having a total paid full-time staff (not simply editorial) of five or less. Most News is Local. A slight majority (53% or 231) of the smaller digital natives in the sample identify themselves as having a general or local focus, with a local community sometimes defined as narrowly as a single neighborhood. That close-to-home focus is not surprising, given the small staffs at these outlets. But the next biggest group of sites (45, or 10%) identify themselves as investigative outlets. Another 6% (28) focus primarily on the state or state government while about 6% (25) identify their focus as politics and public affairs. Few of these sites tend to focus in on events abroad (2%), but one of them, the Seattle Globalist, identifies itself as a “hyperglobal” news site. Opting for the Nonprofit Model. Of the 402 outlets that identified a business model, slightly more than half (204) are nonprofits compared with 196 that are commercial entities. In recent years, the nonprofit model has attracted a significant amount of foundation funding for news gathering. The State of the News Medial 2014 report estimated that roughly $150 million in philanthropy now goes to journalism annually. Some of that is used as seed money for digital nonprofit news organizations: 61% of the nonprofit news organizations surveyed by Pew Research began with a large start-up grant. The goal for these organizations is ultimately finding a sustainable business model less reliant on big giving.